Since having Blake you can say that I have become slightly obsessed with Christmas and now have a lot more Christmas decor in our home than we use to. If we had the space our home would have a lot more decor and I'd definitely make sure we had a bigger Christmas tree. I love the magic of Christmas, giving gifts, spending time with family and seeing my sons face light up on Christmas morning. So today I am sharing with you some pieces mainly for the home from both Tiger and Poundstretcher that are making us more festive this season. Starting off with Tiger we have this cute dancing Christmas tree. When the button is activated on his hand the tree spins around, sings 'Jingle Bell Rock' whilst wiggling and dancing in time to the music. This is a fun item to have in your home this Christmas to brighten up cold dark days. I was also sent an angel broach which is a great for adding a bit of festive cheer to your outfit. The santa hanging is also a fab addition to your home, I'm yet to decide where about we plan to have him. Last of all from Tiger is the felt Christmas tree pen which Blake adores as it makes a jingling sound and he has been walking around shaking it everyday. Another shop I love looking for decorations in is Poundstretcher. Sadly our local store has shut down so to be sent a few goodies to use this Christmas was fab. The cute snowman and snowflake decorations are yet to have a place to go but I'm thinking of maybe having the snowflake over our living room door. This cute little penguin tree handing gives a bit more color to our tree this year and Blake seems to love him too. 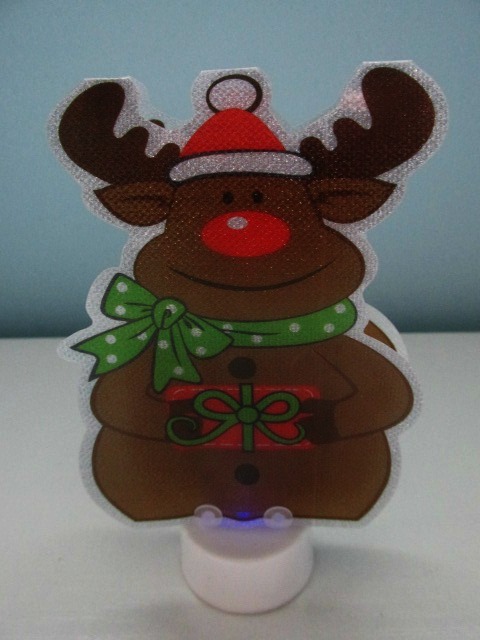 This adorable little reindeer is battery operated and changes color this is another item that Blake really loves looking at and now has it in his bedroom. You can't have Christmas without candles and this silver glittery Christmas tree is perfect. Currently sat on our window ledge this is such a cute festive candle that makes you feel all festive. We love little door hangings and this cream and red This House believes... design is a lovely addition to our Christmas collection to come out year after year. Last of all you have to have the wreath and this gorgeous red and green one will look stunning on your door. We are currently trying to find a over the door hanger so we can put ours up. We love the faux design and colors which makes it all festive an is a welcome addition to our Christmas decor this Christmas. Do you have any new Christmas decor this year? some of these are so cute... Im way behind with decorations this year! These are lovely! I had big plans to make my own wreath but haven't got around to it - again! We love Tiger and they have so many fab little festive bits this season - love your picks! Cute stuff you picked there. The only new thing I picked up this Christmas is new lights for the Christmas tree because I wanted warm lights this year. Tiger is a fantastic shop - never know what you're going to find when you go in, but there's always something you want! I love all of these but you can't beat a dancing Christmas tree can you?! Ours comes out every year!